The employee has been located safely. Thank you for your help. DART is asking for the public’s help locating an employee who was last seen around 11 p.m. Monday, August 10 near Inwood/Love Field Station. 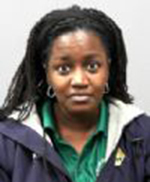 Keri King is a 20-year DART employee working as a Travel Ambassador in the Mobility Management Department. Anyone with information about King’s whereabouts is asked to contact DART Police at 214-928-6300 or text the keyword DARTpolice to 41411. Thank you for your help.